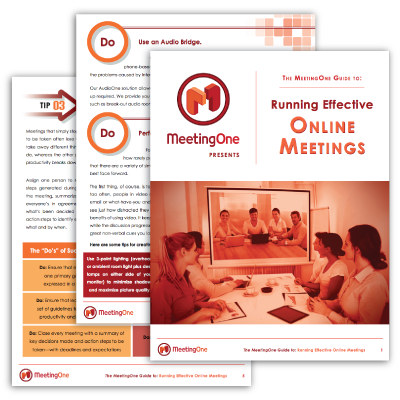 Learn more about audio conferencing and web conferencing solutions with MeetingOne eBooks. You're sure to find a resource perfect for your needs. Browse our growing library of free content loaded with practical information to enhance your conferencing experience. Download exclusive content to get ahead and to add new skills and ideas to your repertoire! 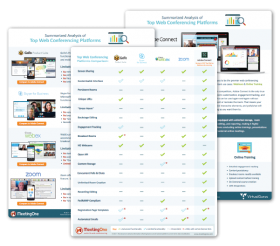 It may feel like comparing apples to apples when looking into the top web conferencing platforms. Unfortunately, it’s not every platform serves the needs of every use case. Learn which one will best serve you! 89% of learners are more likely to participate with gamified learning. 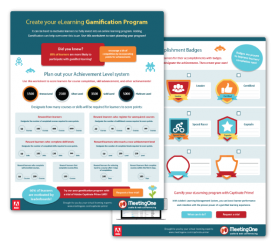 Question is: What are you doing to add gamification to your eLearning? Use our worksheet to devise a scoring system for your LMS and to find badges to award your learners! 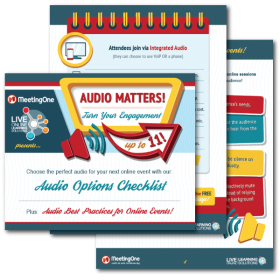 Audio Options Checklist & Best Audio Practices for Online Events! Use these handy checklists & tips to help you decide the right audio to use for your upcoming online events. Choosing the appropriate audio doesn’t have to be difficult – we’ve made it simple with an added bonus page of audio best practices! 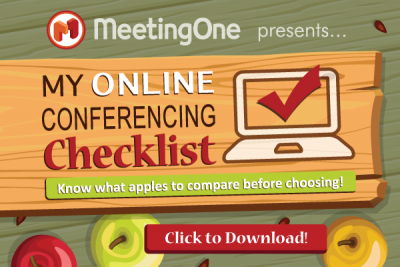 Know what apples to compare before making the big decision on what web conferencing platform to choose for your team. Use this valuable checklist to select the features you just have to have to make an impact. Create beautifully focused discussions inside your Adobe Connect rooms with three stellar layout design ideas, then create your own from what you learn! 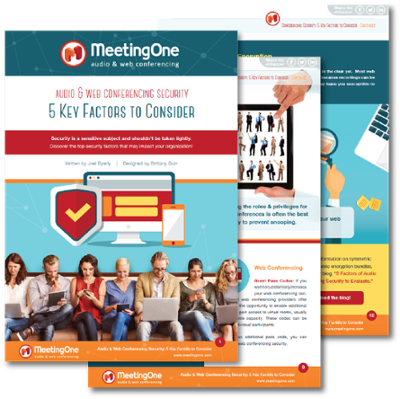 Use this whitepaper to review industry legal requirements and options for web & audio conferencing security. Security is a sensitive subject and shouldn’t be taken lightly. Discover the top security factors that may impact your organization! Engaging learners is tough. 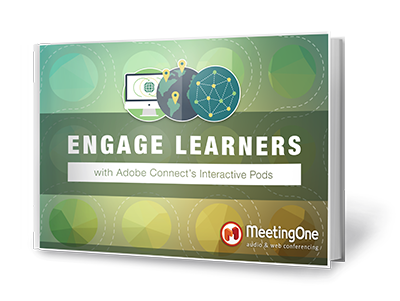 Download our eBook to see what interactive pods in Adobe Connect can do for your online meetings, webinars or trainings. Get tips for creating dynamic learning sessions, how to get learners active and how to determine training ROI, all within Adobe Connect! 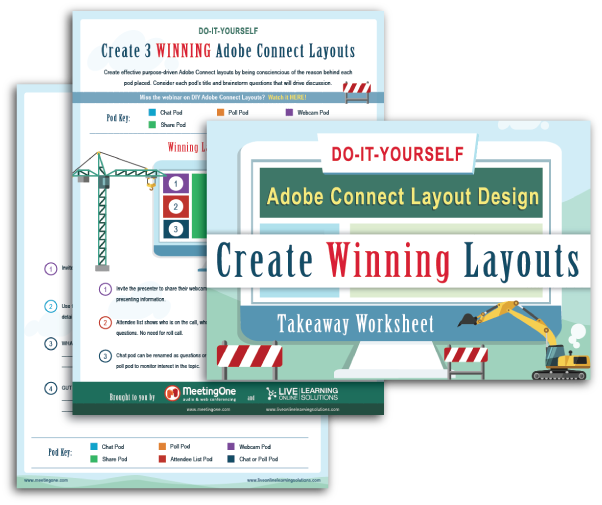 Learn how to build powerful, effective and focused Adobe Connect layouts for your online meetings, webinars and trainings. This template building handout is a useful eGuide for beginners and for those looking to freshen up their rooms! Use this handy tip-rich checklist and to learn how to create and schedule new Adobe Connect events for your next webinar or online training! 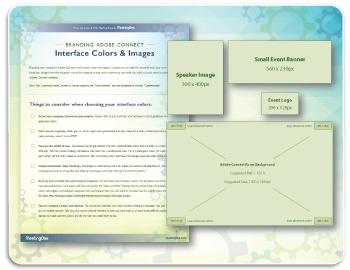 Brand Adobe Connect for your company with these great interface design tips and helpful image sizing templates to make your Adobe Connect room your own! Global learners have differing expectations of training. The best way to understand your global audience is to have them share their perspectives. Send this survey to learners everywhere to learn more about their training needs! Harness the benefit of hiring professionals around the globe! 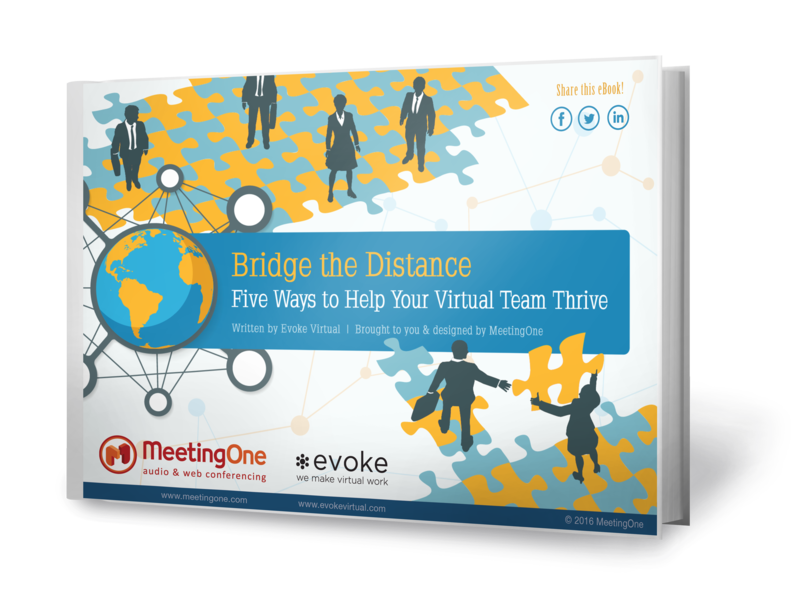 Maintain an effective and collaborative virtual team by learning how to properly communicate remotely in this insightful eBook. 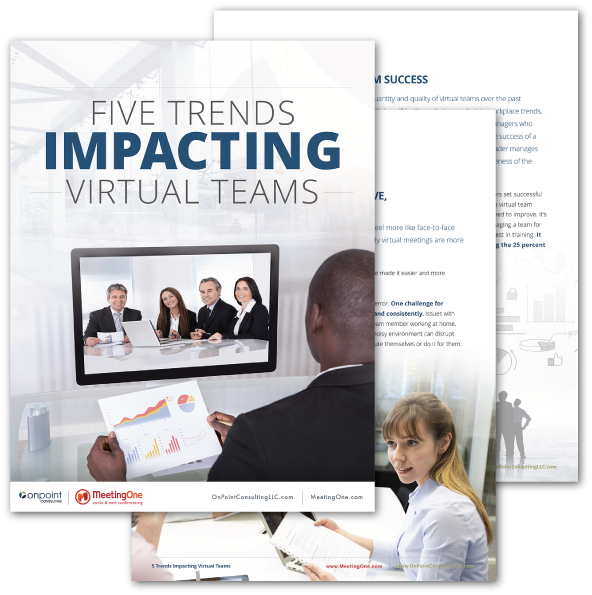 Research has shown about 1 out of 4 virtual teams is not fully functional. Simply being on a virtual team won’t determine whether you will or won’t succeed; your people & processes will. That’s why it’s crucial for virtual team leaders to anticipate the challenges their teams will face so they can help them adapt! Do you find yourself logging into online events, such as team meetings, and becoming so distracted with email, social media or your latest project that you are no longer paying attention? 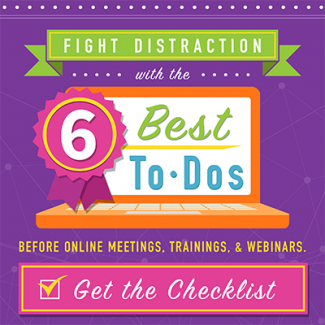 Download our free infographic to learn the six best to-do’s before signing on to your upcoming online sessions to get the most out of your sessions! Learn the do’s and don’ts for running online meetings. Download our eBook to get general tips for effective meetings, learn how to maximize human connection with audio and video and tricks for using all the bells and whistles of web conferencing tools! Have too many *&%^!$@ Meetings? Productive meetings don’t happen by accident. Three things are required to create and facilitate meetings that matter and produce results! 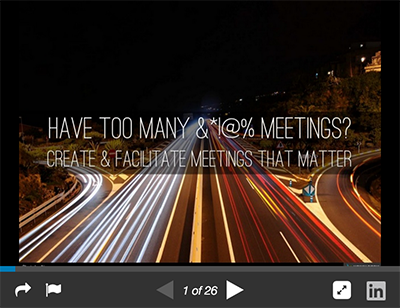 Time is precious, so learn more with our SlideShare on how to create meetings that matter! What’s a critical soft skill to have in the 21st Century? Good virtual presence. As more events are moved online, it’s critical presenters and host be able to run effective sessions. It’s equally important participants know how to interact well. 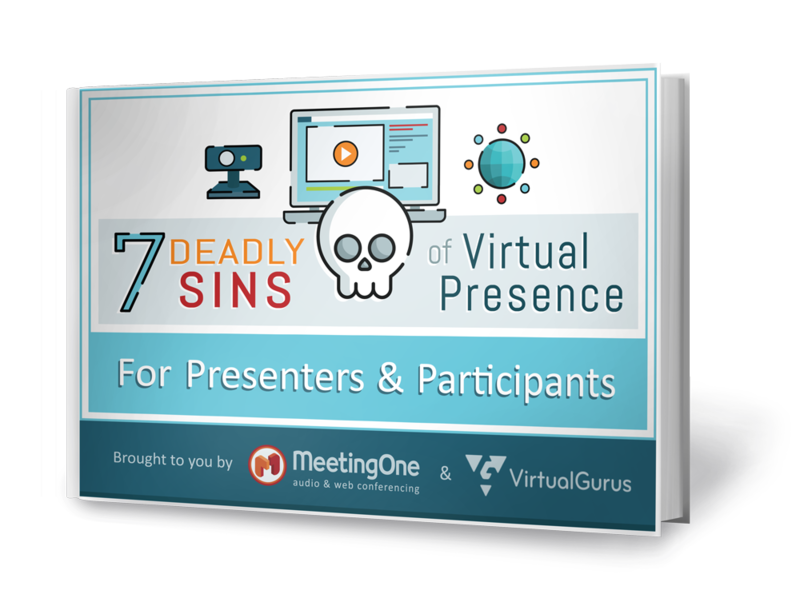 The problem is that most people are likely to commit 1 of 7 deadly mistakes – make sure you’re not one of them! What’s the secret to driving interest to your webinars? Before you send out emails, post on social media, or run ad campaigns, it’s critical you create a compelling webinar title. Using our FREE worksheet, you’ll find recipes for creating solid titles for any number of webinar categories. Then use the last page to practice a few of your own! Trying to connect with learners around the world? 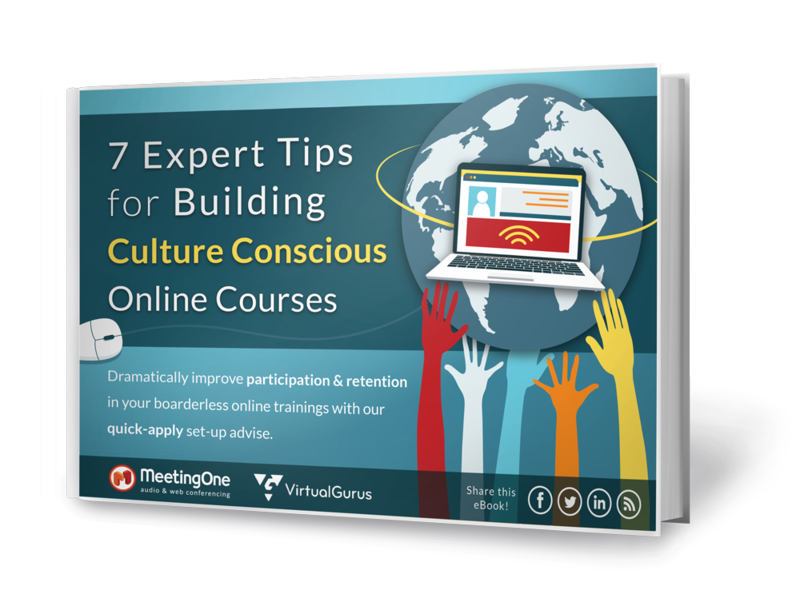 It’s critical that you recognize that their cultural influences and perspectives will shape the way they interact and learn during online training. Consequently, it’s critical you design to meet their needs. We will show you how! What’s the secret for holding successful webinars? Webinars are large-scale productions. 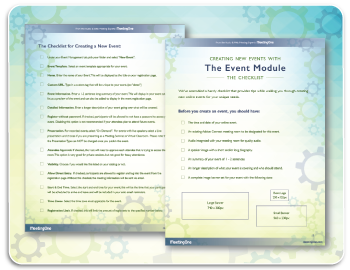 Hundreds of factors can shape the outcome of your event. So, organization must be priority number one! 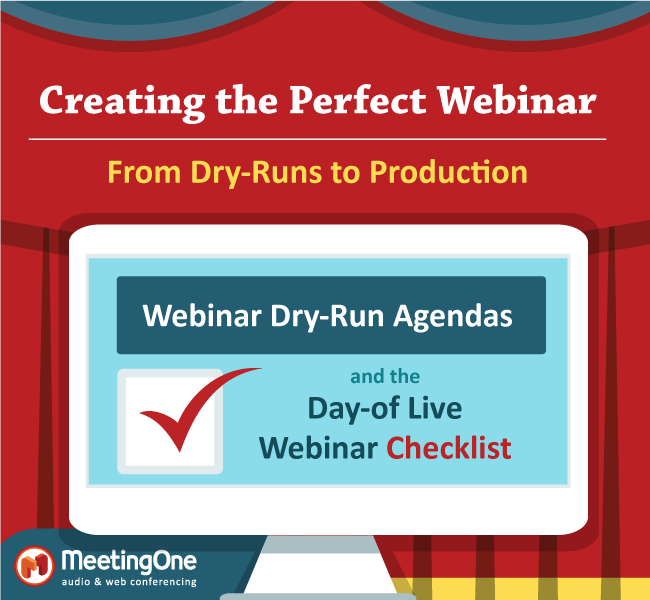 Use our free checklists to create and prepare for a perfect webinar. You’ve mastered the classroom, but can you facilitate an online session? Succeeding with online learners requires a very different approach from in-person sessions. 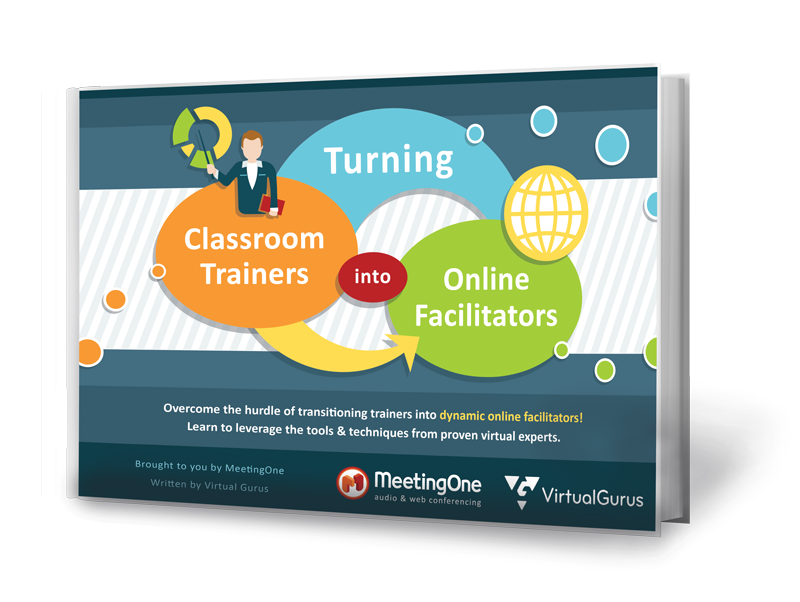 Overcome the hurdle of transitioning trainers into dynamic online facilitators with this easy to read eBook! Learn to leverage the tools & techniques from proven virtual experts. Whether you are hiring a Subject Matter Expert (SME) to present, or are one yourself, a virtual environment can feel like another planet for an industry expert who may not use the technology in their day to day profession. But that doesn’t mean their virtual presentation must suffer! With great tips and preparation, we can make SME’s trainings shine online! Learn how to create virtual classrooms that work! We’ve had years to perfect the physical classroom, but a new frontier has emerged. Virtual training! you need to know how brains work! 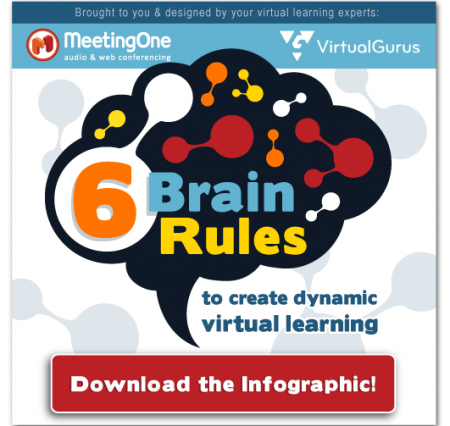 Use these 6 brain rules to create virtual learning that truly teaches your subject! 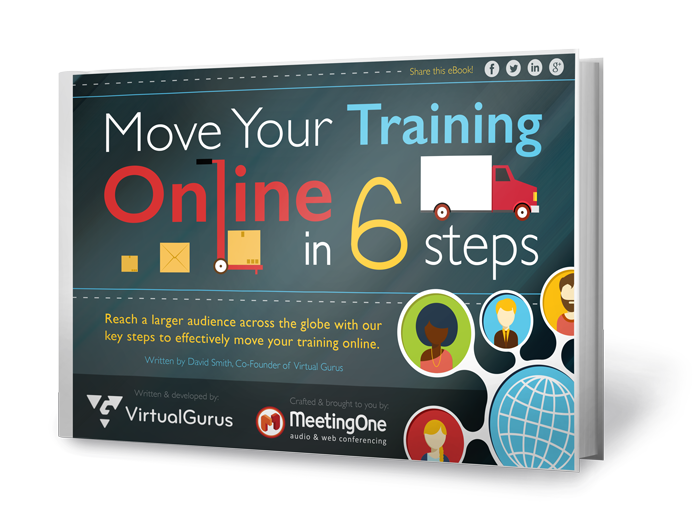 Don’t fall behind the times, move your training online with this informative ebook! 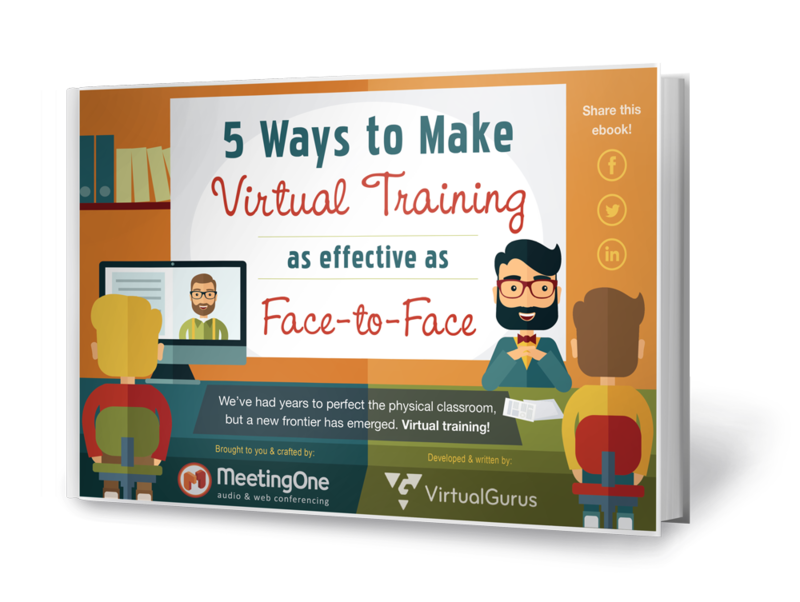 Reach & impact a larger audience by following our 6 steps for taking face-to-face training programs and moving them online. Ready for a new way to deliver online learning experiences that resonates with participants and changes behavior? 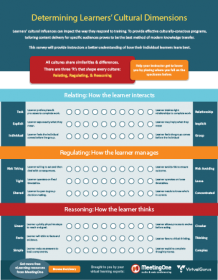 Download the New Learning Paradigm Infographic to learn about the new learning model that combines emotion and experience for highly impact learning sessions. The trickiest part of hosting a webinar is getting people to register and attend. Email inboxes are flooded with webinar invitations, getting your invite to standout is harder than ever. 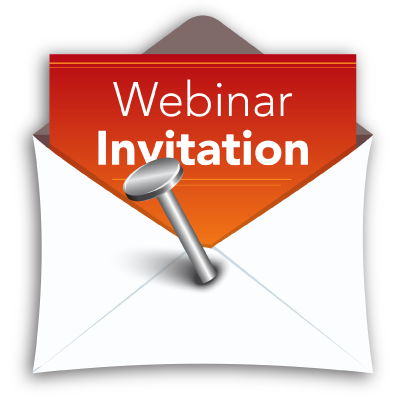 A successful webinar invite doesn’t take much, just 5 things! Learn what those are in our SlideShare. 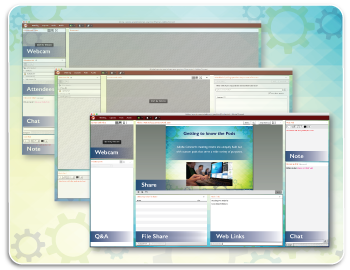 Experience even more with LIVE webinars! Register for upcoming webinars to see our products in action. See how similar industries use web conferencing to reach new audiences or learn valuable tricks for hosting your own online sessions.